I'm facing an issue trying to record old VHS on my Intensity Shuttle using composite. I plugged a console to check if the hardware was ok, everything went fine. Any clue on where to start to move on ? You think TimeBase Corrector hardware might help ? A Time Base Corrector is a must, you will not get good transfers without one, as you have discovered. The VHS deck is going to loose T/C continuity, and each time it does, the transfer stops or glitches. A TBC corrects this, providing a constant T/C reclocking of the signal to the Shuttle. Look for a used Broadcast type TBC on eBay, consumer TBCs are not very good for this. Also, if your VHS deck has a S-Video output, use that instead of composite for a better resolution output. Denny Smith wrote: Look for a used Broadcast type TBC on eBay, consumer TBCs are not very good for this. I agree. Consumer TBCs (which most new ones are) are hopeless at correcting the wayward timebase that comes off analogue VTRs. Would you have any models to recommand, just so I could check how much it would cost me ? I use a Snell and Wilcox Kudos, various models are available. Yes, I too have a Snell & Wilcox Kudos, which I obtained from BBC-TV, and these are generally among the elite brands of TBC that were extensively used in the pre-digital television era (Messrs Snell & Wilcox were former BBC research engineers), and they very occasionally crop up on eBay and the like. Check out For-A, Fortel, PrimeTime, Hotronic etc. As I write, there are several For-A units listed on eBay USA. I've used several For-A TBCs since the early 1980s and providing they're set up right they're very good and reliable. I went on auction sites in my country to check for some Snell & Wilcox Kudos, but everything is costy. - Also fell on this products that are claiming to be TBC. Would you happen to have any kind of experience with them ? An S-VHS recorder/player will only be suitable if it has a TBC card installed or built-in. As for the JVC KM-F250EG, it's a frame Synchronizer which isn't strictly a TBC although there's a good chance that it will do the job for you so it would be worth a bet. The WJ-AVE5 is just a consumer-level video mixer, though, so leave it alone. All it does is to lock an incoming signal - such as an off-tape playback - to a stable source such as a camera in order that you can mix smoothly or cut between inputs (called "genlock"). It doesn't actually correct the timebase of the incoming video signal. Another approach would be to acquire a regular DVD recorder that has line video and audio inputs and outputs. DVD recorders typically accept unstable signals and stabilise them before writing to DVD or HDD (the conversion can't take place if the timebase isn't up to spec) so by taking a loop-through into your capture device I'm pretty confident this will work for you. Thankfully, you can pick up DVD recorders really cheap on eBay etc these days so it's worth a punt! There is a DataVideo TBC 4000 currently on eBay for $390. Has S/Video and composite in/out, 4-channels and a video processor for color correction onboard. This should do the trick. So if i get this right, the cheapest solution for me would probably be to buy an HDD recorder and give it a shot. I'm thinking about trying this one : Sony RDR-HXD870. Any thought about it ? Alexandre Martin wrote: I'm thinking about trying this one : Sony RDR-HXD870. Any thought about it ? Yes, it will do the job! Thanks Massimiliano for your answer. I'm buying one tomorrow to see how this will do. I'm also planning to rip some old HI8 tapes of my parents but the camcorder is dead. What would you recommand for reading them ? Thanks a million for your help. The adaptor you refer to is for use with VHS-C cassettes not Video-8 or Hi-8. They are totally different formats, both physically and electronically. For the latter, you do need an appropriate playback device such as a camcorder or compatible VCR. I've been reading the forums about the intensity shuttle and your recommendations for time base correctors for over a year now. I have seen in a prior post once that you personally use the snell & wilcox kudos tbc-11. I've been searching eBay now for several months and have yet to see one pop up. Is it only that specific model that you think is the gold standard or would another model work. I have bought the Datavideo tbc 4000 but have been somewhat disappointed with the results. The resulting image with the intensity shuttle appears to be a blurrier image than using the canopus advc 300 direct from the video tape. I have actually already transferred many tapes with the advc300 in the past but would like to have a better archive copy for all of my family's super beta tapes as well as many important vhs tapes. I'm willing to spend up to $500-600 for a great time base corrector. So I would love to hear what you recommend at this point for me. Thank you for all your posts I have read while lurking without an account before. As previously noted, I use a Snell and Wilcox Kudos series, which also works very well. There is a Kudos TBC 180 on eBay right now (in USA) for $450. Another in the UK for around the same price. Thank you Denny for the recommendation. Do you know if the tbc 180 is on par with the 11 that Colin uses? I've heard that Panasonics HDD recorders are doing the best job. There are several For.A TBCs and a couple of Hotronic models being offered on eBay.com right now, and with relatively low starting prices. Worth a punt I would say. A few months ago on ebay, there was a SNELL & WILCOX by Kudos TBC SYNCHRONISER MODEL 24T. Is this considered a later model than the one that you were recommending? Also is snell and wilcox better than For.A and Hotronics? Is there a difference between the tbc and tbs? Beware of Snell & Wilcox. Some models (e.g. TBS100 Kudos) expect for a perfect sync signal from the source and couldn't be suitable for your purpose. Yes, a TBS expects a good sync signal, while the TBC will correct (up to a point) minor issues in the sync signal, and reclock it to a good continuous sync on output. That's what a TBC, Time Base Corrector, does. You do not want a Kudos TBS Signal Transcoder synchronizer, or NRS (Noise Reducer synchronizer), some newer Snell and Wilcox models combine a TBC with a NRS (NRS 50 does). You can always get the model number and do a search to be sure what you are looking at will do Time Base Correction. I use a Kudos NRS 50, which combines a TBC with noise reducerto clean up old tape based video when doing transfers to disk media, it allows for some chroma and contrast adjustments to the signal as well, and mine gives a SDI output in addition to analog outputs, adding a hardware based ADC (Analog digital converter) to the mix. Thanks Denny. I'll keep my eyes out for an NRS 50. Do you find that you are able to keep the settings constant? I'd prefer not to play with those chromatic and contrast settings each time I change the tape. No, I set it once for the tapes that are exposed similarly, and only change it if I see a big jump in exposure or color balance. The controls are subtle changes, nothing dramatic, except for the gamma setting. thanks Denny. Hopefully i can find one soon. Does anyone know what the differences between the nrs30 and nrs50 are? The Kudos NRS 30, 50 and 70 are all based on the 30 model, but as you gomup, additional signal processing features are in the unit. I've always noticed that the "detail" switch on the 1980 was essentially the same as setting the witch to NOR and sliding the soft/sharp slider to the middle position. I guess I switched it to detail because I figured it would "lock in" the middle-of-the-road sharpening setting. threshold may be accurately set." So the NRS 30 it is a TBC with a noise reducer processor added. Overscan to remove visible head switch disturbance"
So the 50 has auto thresholdld settings, additional signal correction processing for Chrominance/Luminance, and a SDI outputs for sending to your Video card for capture and compression. Given a chopice between the two, I would get the 50 or even a 70, with the new advance feature that automate the processing more. Very good information. Thanks Denny. I have been reading through this thread, and I have a similar situation. I received a package with the Intensity Shuttle, and a Panasonic AG-1980 Desktop Editor. Before reading this thread, I had no idea TBC would be a big deal. Luckily this device happens to have it. I am having problems getting picture up on my screen. 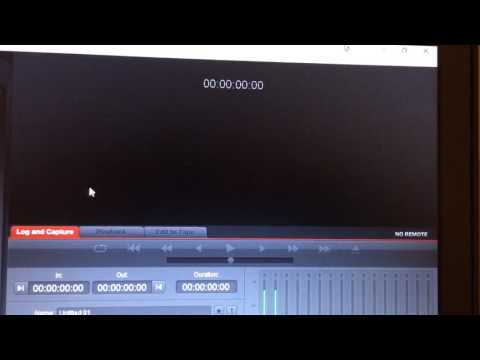 I can get audio just fine, but nothing else. I have switched between all the connections available, and even got an SDI->HDMI converter to see if I could get anything. TBC within the Pana is not enough (won't do passthrough)... you may need to synchronize the signal between the deck and the Intensity. VHS Decks, even editing ones, like the Pana, as Massimiliano stated, do not have a true TBC that insures output signal is time code locked. You need a standalone TBC to reclock TC and imped a continuous TC in the output video stream, to capture the signal in a computer video card.p, which is looking for the TC to Clock the incoming video signal. Yes, I agree. I have lots of VCRs of all flavours - professional, semi-pro and consumer - and although some of them have what their manufacturers like to call "internal TBCs" they're just not as robust as you'd assume. The thing here is that all - yes all - Blackmagic video capture devices are totally incapable of digitising incoming analogue video signals from VCRs without full reclocking by broadcast-grade TBCS. I use Snell & Wilcox Kudos and For-A devices in line and they're the only products that can present my various Blackmagic devices with the signal stability and pre-processing they require. I acquired a snell and wilcox Kudos tbc110n today. I've been trying to acquire the nrs50 for over a year to no luck on eBay. Does anyone have an opinion of the tbc110? I have a Kudos TBC-11 and it's the best (of five) TBCs that I have. Any Snell & Wilcox TBC is good but models in the Kudos range are built like tanks - they'll sort out anything you throw at them. Good purchase! Thanks Colin. It appears both the nrs 30 and the 110 are kudos models. So i guess it will be interesting to see how they compare. I have the Kudos NRS50, which adds a SDI post processing output, in addition to the analog outs. As Colin said, very well build and versatile TBC and video processors. Thanks Denny. If I'm using the intensity shuttle to capture the footage from the tbc, is there any advantage to having an sdi output in my case? Should i buy the blackmagic sdi to hdmi converter and then connect that to the shuttle? Daniel Gordon wrote: Thanks Denny. If I'm using the intensity shuttle to capture the footage from the tbc, is there any advantage to having an sdi output in my case? No, because the Shuttle doesn't have an SDI input. However, it does have HDMI so you could obtain a SDI-HDMI converter. However, I wouldn't bother and would opt to take component video and audio outputs from the TBC instead. I used a Shuttle for about a year before investing in other systems like Teranex for my work and I give it component input from TBC. You got me very interested in the Teranex 2d processor. I understand that I may be one of the very few people that would even consider a teranex for transferring my family's home movies on super betamax and various vhs tapes. I do have a question for you about the quality. Have you ever upconverted vhs tapes to hd or even 4k and noticed a quality improvement vs just the native resolution transfer? My super betamax i believe is the only one that offers s video out. I'd then connect that to my new snell and wilcox kudos tbc. Then im considering outputting sdi to a teranaex. Is there a noticeable difference between the intensity shuttle quality and the Teranax 2d for basic super betamax or vhs tapes at the highest quality? Thank you so much for all the info. The one thing that's worth noting about the Teranex 2D is that although it's a "converter" it still cannot reclock the incoming timebase from analogue videotape sources! I find that incredible, considering the manner in which Blackmagic promotes its ability to accept video inputs from anything - including SD. In terms of quality, yes the Teranex 2D is better than a Shuttle, but in ways that aren't immediately noticeable to the untrained eye. What the Teranex models give you is much more control over the image - colour correction, noise reduction, aspect ratio conversion and up/down scaling etc. The Shuttle is a great device but is essentially a pass-through device with minimal control options. I do like it though and it's great for the price. However, the fact that you'll be using a Snell & Wilcox Kudos TBC in your workflow will make a huge difference. Given that it can issue an SDI output, you'll then give this to the Teranex for onward processing and have a large range of options. In answer to your question/s, I do regularly take a SD 4:3 PAL (720x576i/50) input and capture it either "as is" (professional video/TV/film archives tend to specify no aspect conversion whatever) or I'll convert to a 4:3 image within a 16:9 frame (pillarbox) or upscaled slightly to 14:9. The latter works well for stuff that's coming from Beta-SP, DigiBeta, DVCAM, DVCPro etc etc. Rarely am I asked to upscale SD material to 16:9 widescreen HD (1080i, 1080p or 720p) because it does actually introduce some geometric distortion on the Y axis, although you'd have to be familiar with the 4:3 original to detect it. In your position, I'd capture as 4:3 SD only. When I've done this from very old videotapes for broadcast TV companies or prod co's they prefer this because their editors can then make aspect ratio decisions in Avid or whatever and the results are usually pretty good. It also leaves their options open. One more thing - I wouldn't bother with the Teranex 2D because I have a feeling that it will be discontinued soon (it has a single Thunderbolt 2 connector which is no good these days). The Teranex AV does all you need and is much cheaper - and it has better audio inputs in the form of XLR connections which the 2D doesn't. That, for me, is a real pain because I can't be bothered with the DB25 multi connector which needs an Avid-spec snake. Crazy. So,,,,,, S&W Kudos + Teranex = a great combo for A-D capture. Go for it! Thank you so much for that very detailed reply back Colin. You are really incredible in what you do. I am sure you produce amazing transfers with your workflow. Daniel, the Kidos NRS30, like the 50, is also a video processor, and can make basic adjustments and noise reduction to the video signal, get and read the Kudos manual for details. I agree with Colin, keep your 4:3 transfers in SD, and if you want to upscale them later in a NLE, you can do so, but still have the original full SD files as archives. Use the Kudos video processing features to clean up the signal, but do not overprocess it. I second the Teranex AV also. How funny that only yesterday I should predict the demise of the Teranex 2D and 3D! Today, on the updated website, we're left with only the Teranex Express and Teranex AV. I'm not so good at forecasting weather! Colin Barrett wrote: How funny that only yesterday I should predict the demise of the Teranex 2D and 3D! Today, on the updated website, we're left with only the Teranex Express and Teranex AV. Thank you Colin and Denny for the great recommendations. I just picked up a deal on a Teranex av and should receive it by the end of the week. I'll let you guys know my progress. Colin, yes, you called that one very well. haha. I ended up acquiring a snell and wilcox tbc- 11 as well in addition to the nrs30. The eBay listing said it's a 110 N but it's clearly an 11 model. I will let you guys know the comparisons i find between the two. This is kind of interesting as I didn't realize i was getting the same model as Colin when I bought it. Daniel Gordon wrote: I ended up acquiring a snell and wilcox tbc- 11 as well in addition to the nrs30. The eBay listing said it's a 110 N but it's clearly an 11 model. I will let you guys know the comparisons i find between the two. This is kind of interesting as I didn't realize i was getting the same model as Colin when I bought it. They're now becoming very rare so you did well locating one. I picked up another S&W Kudos TBC from a London dealer last week so I now have two!! I now have both time base correctors in my posession in addition to the teranex av. I've been struggling all day to test out the equipment but so far am getting a "no input" message. Currently im testing it out just for a laser disc player with an s video out to the snell and wilcox tbc. i've tried both of them with the s video input for the video and then attempt to use the bnc connector for the output to the teranex. It doesn't have any signal though. Am I doing something wrong? The fact that both tbcs don't seem to work makes me think that the units are probably okay. A Laiser Disk player is only going to play out on TV monitor, the unit know when it is connected to any type of recording equipment and blocks the signal to protect the Laiser disk copywright. This was a condition of releasing major films on a disk, same goes for DVDs. Try a VCR as a signal source. thanks Denny. But im having the issue even with a vhs player. Still says no input. Is the issue that im going in with s video and trying to get sdi out from the tbc? Is there a special setting to get sdi out on the tbcs to force sdi out? Also, is the usb connection to the computer the best way to get the video captured? There's also an ethernet port but its for1 x RJ45 Gigabit Ethernet for remote control and configuration.